Howdy and hello my crafty friends! I'm enjoying my extra time off from work by completing yet another Altenew Academy class. 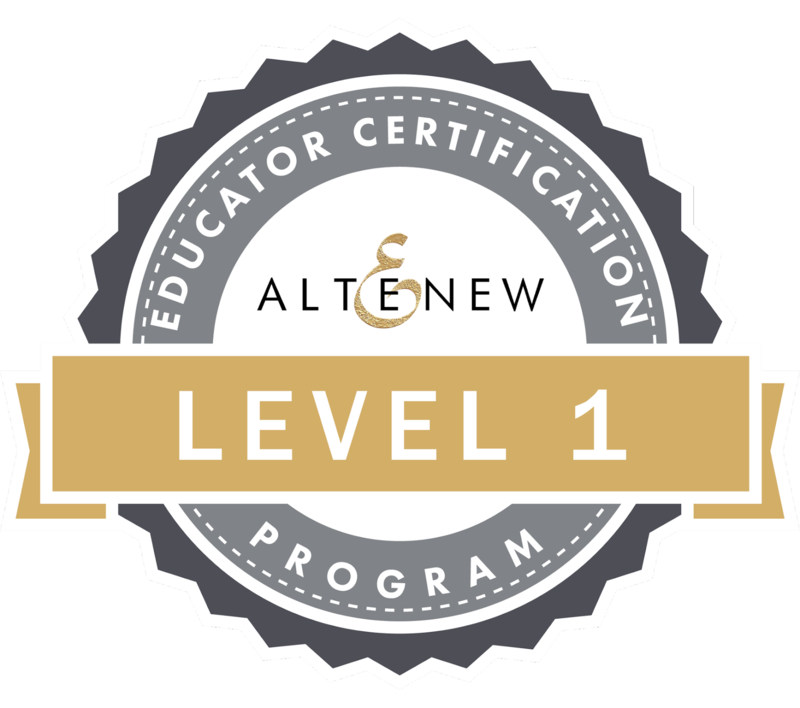 I'm making it a priorty to continue my work towards my Altenew Educator Certification! The class I just finished was called Celebrations: Stencil Techniques and the teacher was Laurel Beard. Seriously a great class! 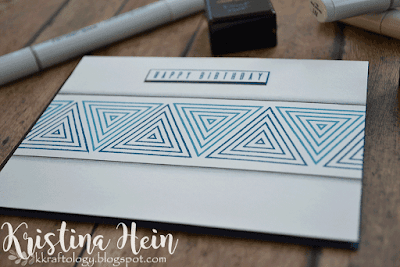 Yet again jam packed with all sorts of ideas on how to use and create your own stencils! 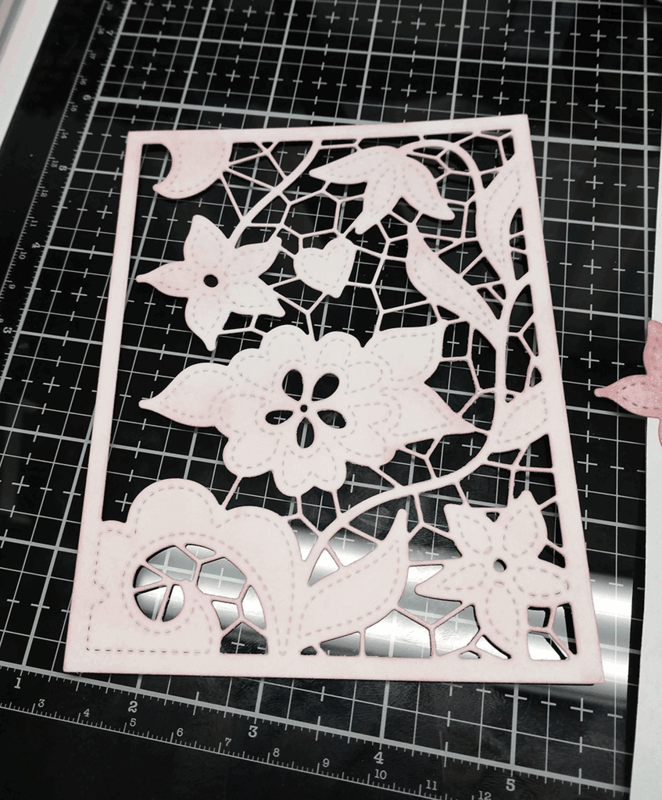 I started by using the Doodled Lace Cover die to cut out a thick piece of cardstock as well as a thin piece. I took the thin piece of cardstock and taped it down to a scratch piece of paper. I liberally sponged on Victorian Velvet distress ink until I happy with the color. I don't reach for this color very often but I don't know why. It's gorgeous! I took a pair of scissors and started cutting apart all of the floral elements. Back to that thick piece of cardstock. I taped it down to a gray piece of cardstock. 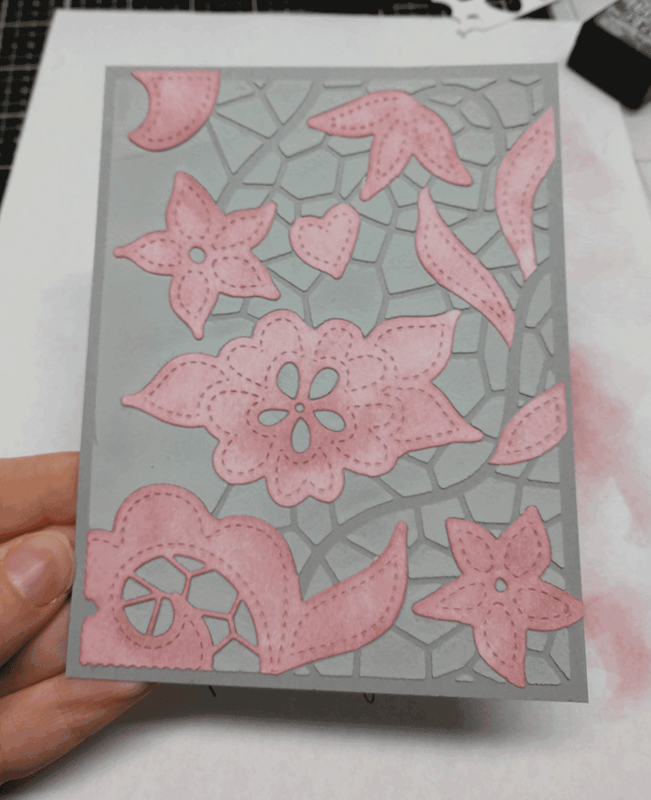 I dug around and found my stash of embossing paste. I squished my Hickory Smoke distress ink pad down on to my glass mat. 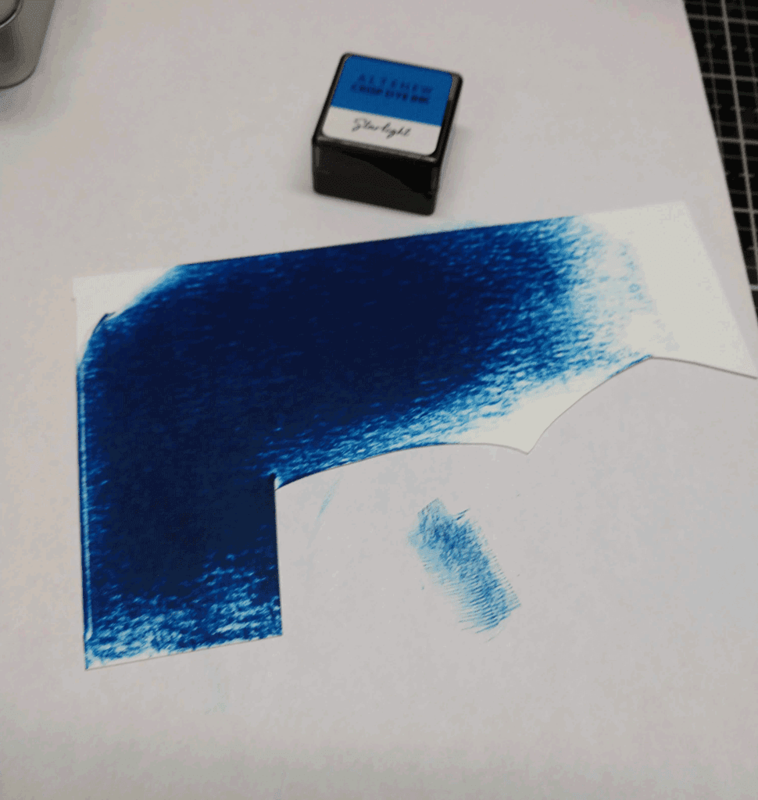 Then I took a scoop of paste out and mixed it with the ink. I did this several times until the paste was as dark as I wanted it to be. I used a plastic spatula to spread this over the top of the die cut cardstock. I worked quickly so the paste wouldn't dry our before I was done. 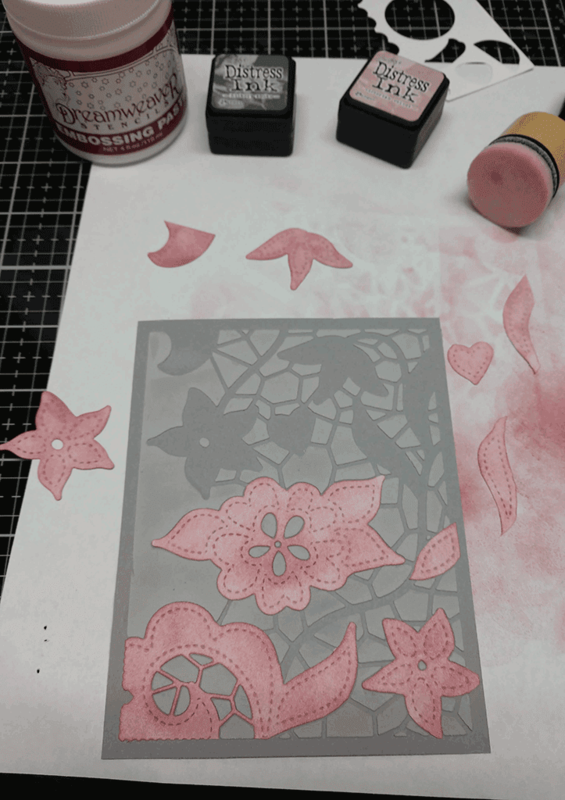 Once it was smoothed out I removed the die cut paper and cleaned up my tools. 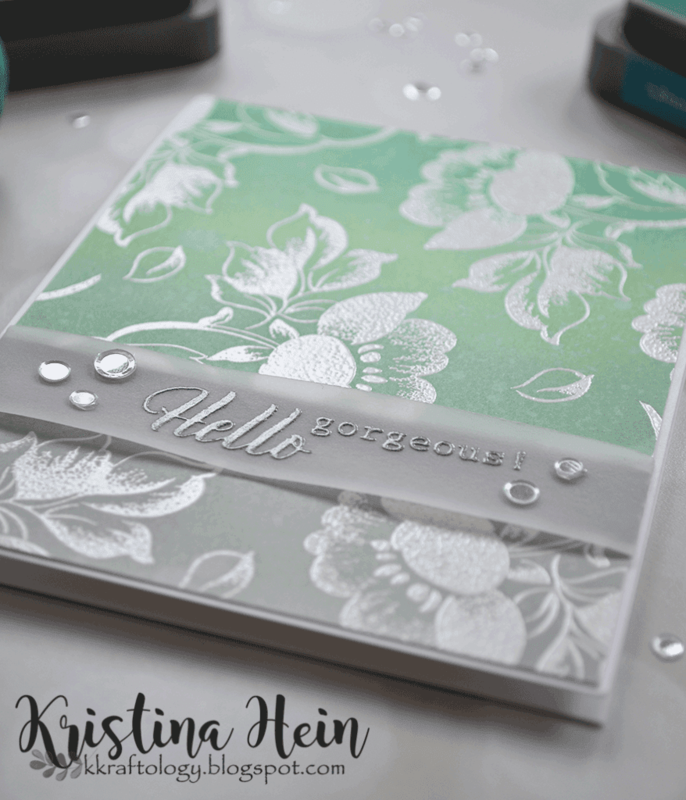 This is very important when working with embossing paste! I set this aside for a little while until the paste was dry. Then I started fitting the cut out floral pieces into the embossing paste piece. I glued the pieces in place with a liquid glue. Here it is with all of the pieces glued in place. I took the completed panel and attached it to a white, side fold A2 card base. I took my Wink of Stella marker and went over the leaf and heart shapes. Now...how to add a sentiment. I didn't want to cover up the cool background! I found a small I Miss You sentiment in the Hug Me set from Altenew. 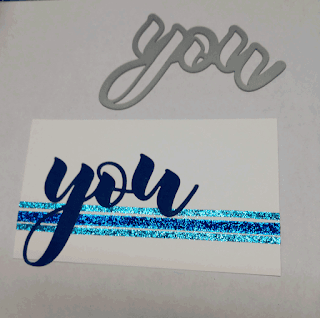 I masked off the "I" and stamped it on white paper with Hickory Smoke Distress Oxide ink. I sprinkled on clear embossing powder and melted it with my heat tool. I cut it down to a small strip and angle cut the right side. I put foam tape on the back and glued it on the background. 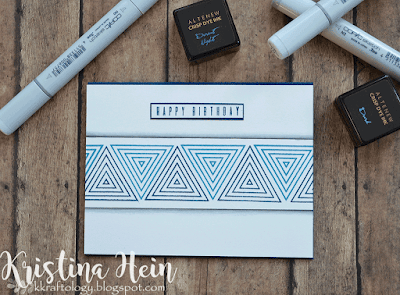 I really love the look of the embossing paste! I tried to capture the dimension in the photo below. This class was a lot of fun and I'm looking forward to the next one! Thanks so much for stopping by. I really do appreciate it! Hey there fellow 2 Cute Ink fans! I'm here with a winter themed project to share with you today. 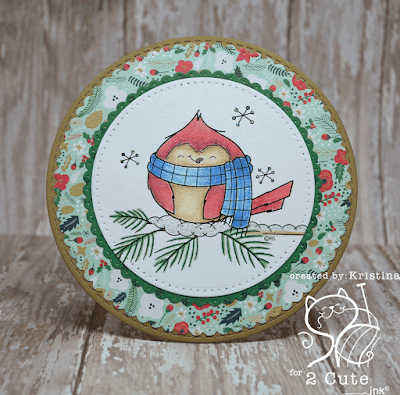 Isn't this Winter Cardinal just the cutest darn thing ever? I know, I say that about all of Heidi's stamps but I just can't help myself. First off, you can get your hands on this digital stamp right HERE. I decided to use my colored pencils to color up this little cutie. I also picked my colors based on the patterned papers I had picked out. All of the colored pencils I used are Prismacolors. I used Gamsol and a blending stub to smooth out the pencils. I forgot how lovely the colors look when blended with Gamsol. 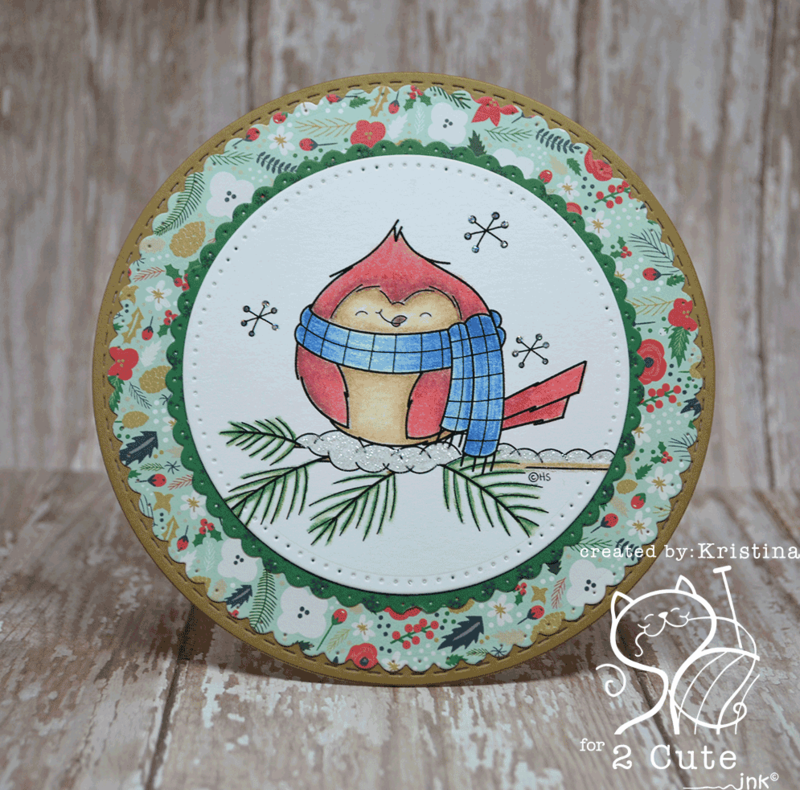 All of the layers were cut out using circle dies from Elizabeth Craft Designs. 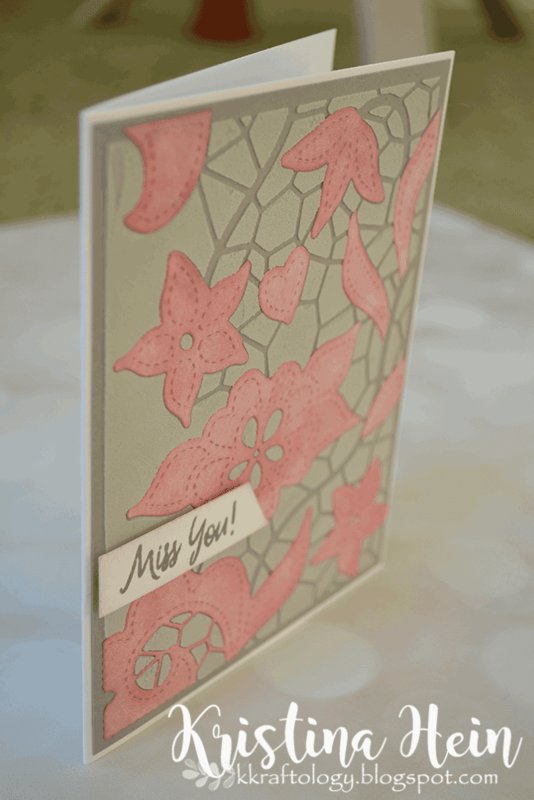 The patterned paper is from Echo Park's Deck the Hall paper pad. 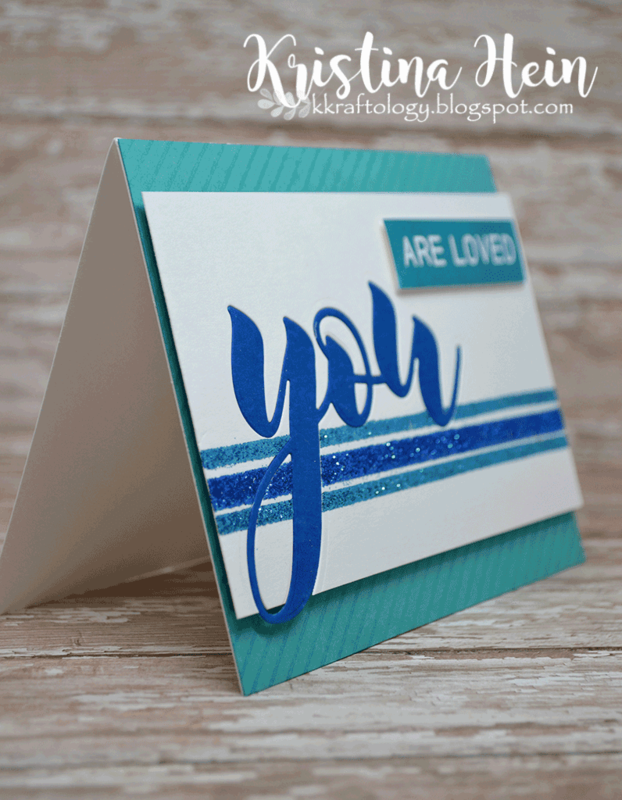 For the cardbase layer I used a brown from Stampin Up. I cut all of the layers out and glued everything together. For the final touches, I added Star Dust Stickles to the snowflakes and Frosted Lace Stickles to the snow. All done! 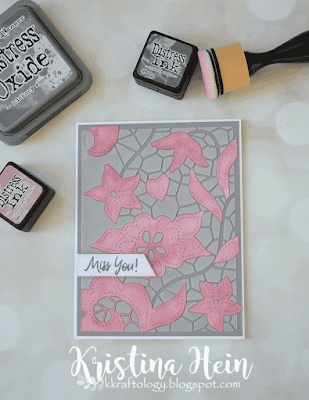 Now grab this digital stamp for yourself and get to crafting! Look at that! 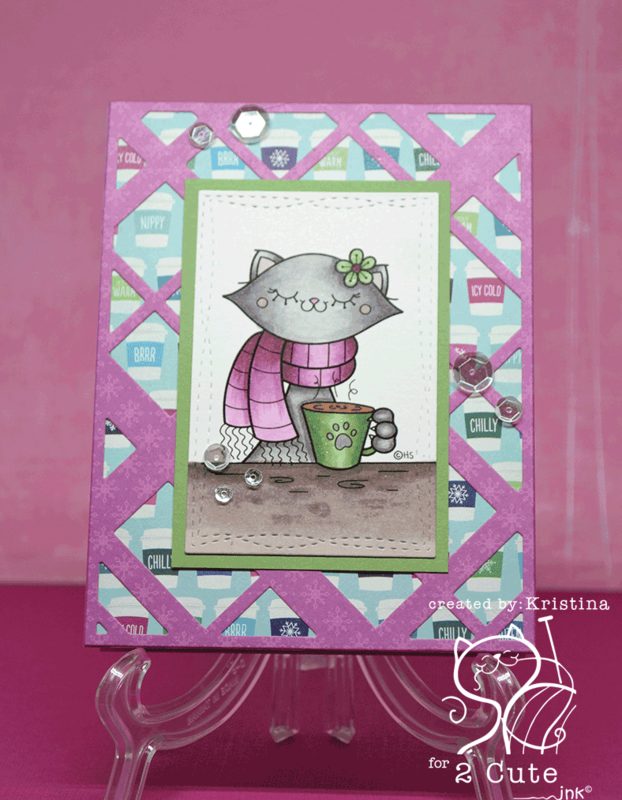 I'm back again almost lickety-split with another coffee themed card to link up for the Coffee Lovers blog hop! Did I mention how much fun I have making these coffee themed cards?? This card was also a labor of love. During the recent 30 day coloring challenge hosted by Kathy Racoosin, I colored up this sweet Holiday Anya 6 from The Greeting Farm. I did two versions. One stamped with black and the other with Inkon3 fadeout ink. I really wanted to do some no line coloring. I'm not going lie, it's hard for me! I am however pleased as punch with how she turned out! After I was done coloring, I added Nuvo aqua shimmer in glitter gloss (love this stuff!). As soon as it was dry I went ahead and cut her out with scissors. I decided to leave a small white border all the way around. For the little section between her feet I used a craft knife. 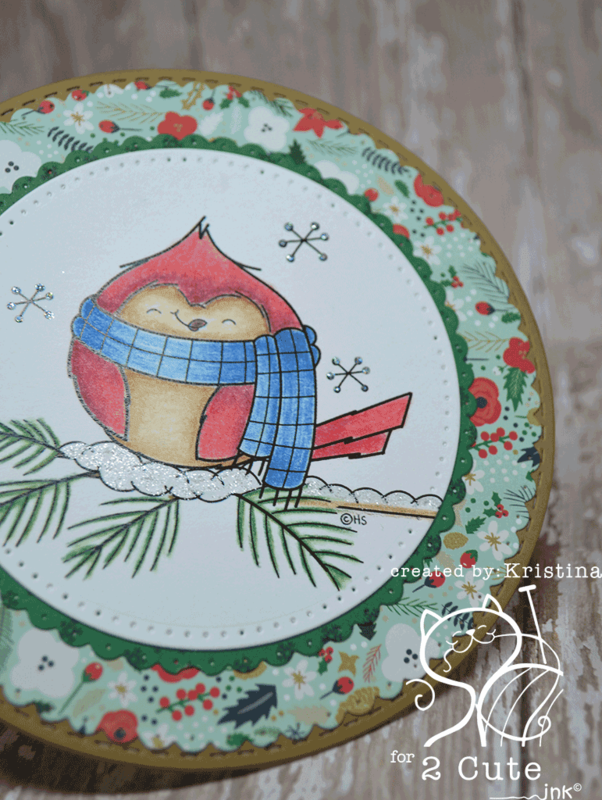 I pulled out three patterned papers from the Doodlebug Frosty Friends paper pad. 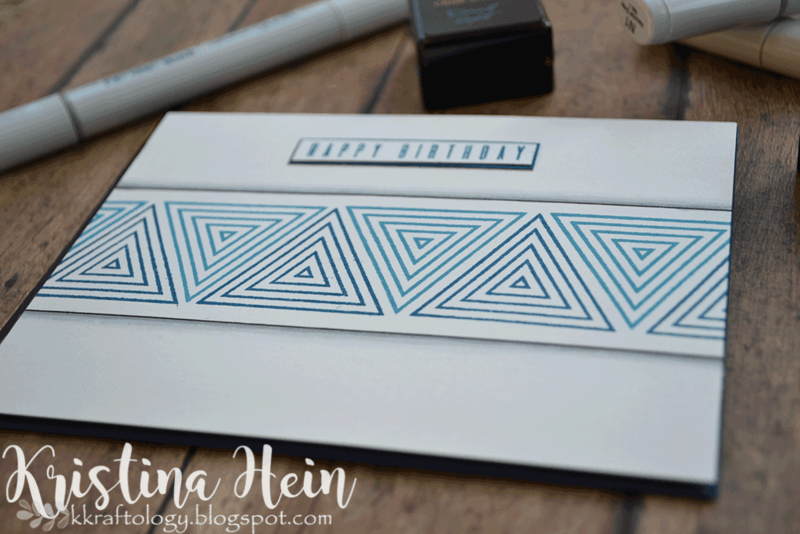 I have been trying to actually use my patterned papers instead of hoarding them. It's SO hard!! I just want to admire the paper all day long. LOL! 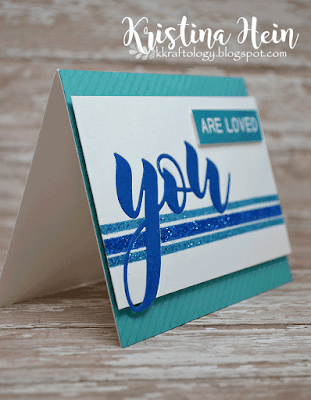 I cut the dotted aqua/green paper with an oval die from MFT Stamps. 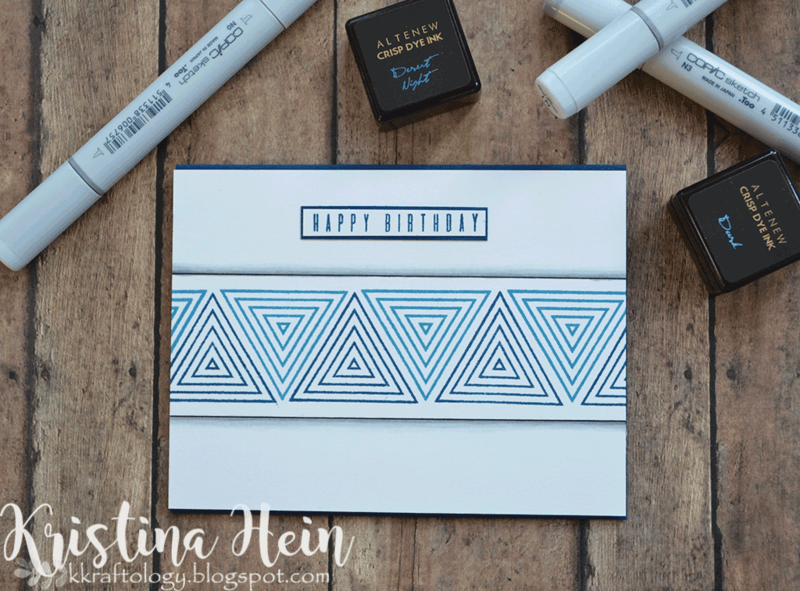 The striped paper I cut out using a rectangle die from Mama Elephant. 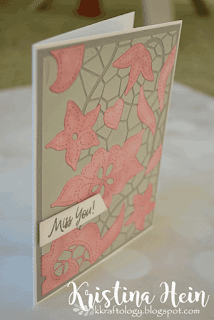 The white paper is cut out with another rectangle die from the same Mama Elephant die set. 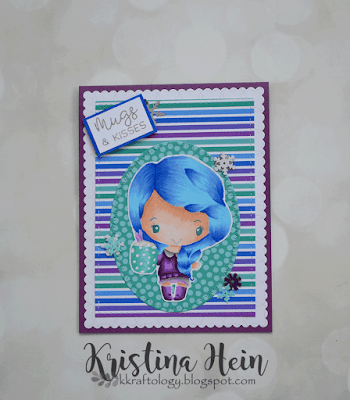 I dug through my colored cardstock collection and found a pretty purple that matched so I cut an A2 sized cardbase. I glued each piece in place and added Holiday Anya on top. I didn't use any foam tape for any of the layers. 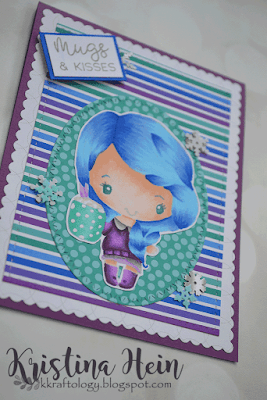 Then I stamped the Mugs & Kisses sentiment that comes with Holiday Anya in a gray ink onto white paper. 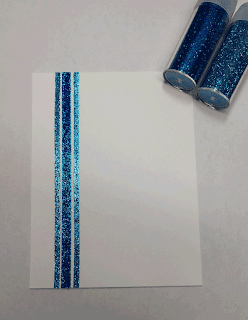 I didn't have quite the right shade of blue so I took my B28 copic to a piece of white paper to make my own! 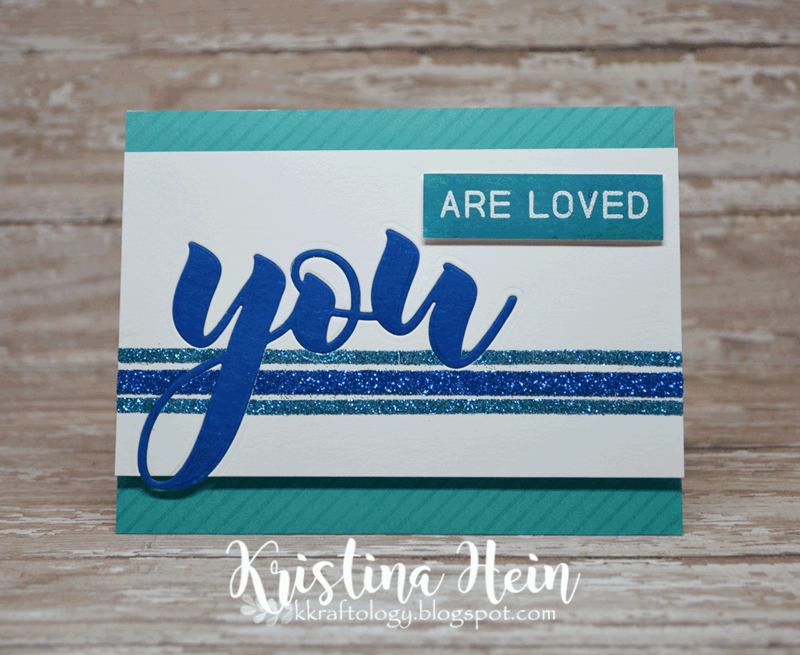 I layered it with the sentiment and this was popped up with foam tape. I though some sequins would add some extra sparkle but I ran across these assorted snowflakes that I got as a freebie gift from Lawn Fawn. I glued them around wherever I thought they looked right. There you have it. I am quite enamored with this card. Hope you like it too! Don't forget to make some fall/winter coffee/tea/cocoa themed cards and link it up right HERE! Be sure to use #fallwinter2018clh! Another one of my favorite times of year has arrived at last. 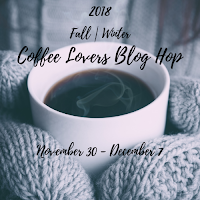 The Fall/Winter Coffee Lovers blog hop!!! The chance for me to ink up some of the coffee themed stamp sets I have been shamelessly collecting. It totally justifies their purchase, right?? Anywho, I'm hoping to complete several cards for this round so wish me luck. Here is my first card to share! 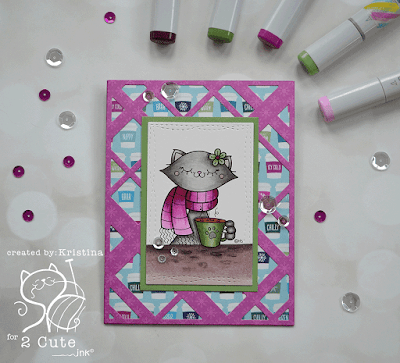 I used this adorable digital stamp from 2 Cute Ink called Penelope Cat. You can purchase her right HERE. 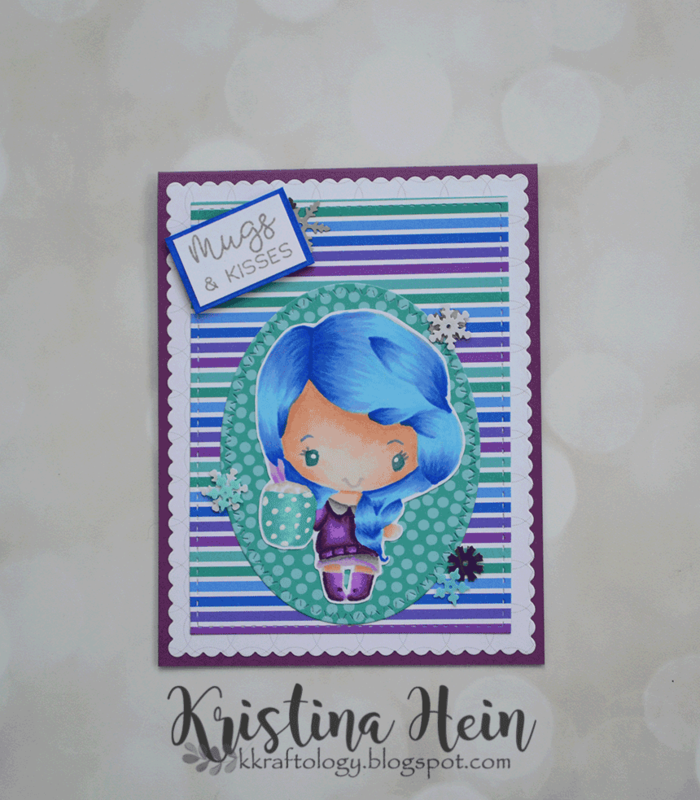 I printed her out onto Cryogen White Copic safe cardstock. I had already pre-picked the main piece of patterned paper I wanted to use so I went through my Copics looking for colors that would match. Here is the list of colors used. Once she was all done I moved on to the rest of the pieces. 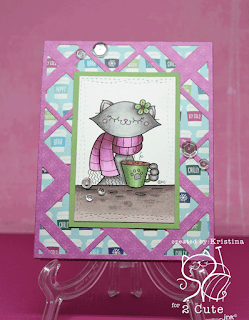 I cut her out with a Wonky Rectangle die from MFT Stamps. I handcut a thin green layer out of a coordinating solid green cardstock from Stampin' Up. Now, can we talk about this background?? The base aqua coffee patterned paper is from an older paper pad. It is called Winter Wonderland from Pebbles. I also pulled the pinkish patterned paper from the same paper pad. Now came some more fun. I cut it with a plaid die! My crafty heart goes a little mushy when I get to use this die. It is the Diagonal Plaid die from Lil' Inker Designs. It's awesome. 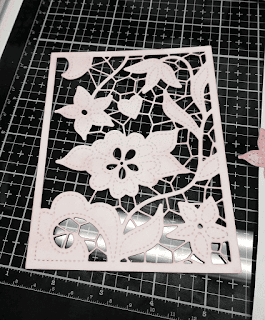 I glued the coffee print paper to a pink cardbase. Next came the plaid pinkish paper, the green layer and the cat layer. For the final touch I added some different sizes of sparkling clear sequins from Pretty Pink Posh. And that's it. It's a pretty simple card even with the Copic coloring. I encourage you to check out the 2 Cute Ink Esty store here. I also want to encourage you to play along with the Coffee Lovers blog hop. You can link up your creations HERE. Be sure to use #fallwinter2018clh!